3.18.2019 – The Morning Journal reports on our collaborative planting efforts at Oberlin Great South Woods. 3.7.2019 – The Chagrin Valley Times reports on the Land Conservancy’s support of Land and Water Conservation Fund action in Washington D.C.
3.1.2019 – Knox Pages reports on the permanent conservation of Valley Head Farm along the Mohican River. 2.28.2019 – Commentary in the Chagrin Valley Times applaud’s the Land Conservancy’s efforts to permanently conserve and steward local parkland. 2.20.2019 – The Mount Vernon News reports on efforts of the Ohio Land Bank Association. 2.18.2019 – The Record-Courier reports on the Land Conservancy’s work to permanently conserve more than 56,000 acres across Northeast Ohio. 2.16.2019 – The Medina Post reports on the Land Conservancy’s work to permanently conserve more than 56,000 acres across Northeast Ohio. 1.31.2019 – The Chagrin Valley Times reports on the Land Conservancy’s work to permanently conserve more than 56,000 acres across Northeast Ohio. 1.29.2019 – The Tribune Chronicle reports on efforts the Land Conservancy is undertaking to conserve a property in Trumbull County. 1.27.2019 – The Star Beacon reports on efforts the Land Conservancy is undertaking to conserve a property in Ashtabula County. 1.10.2019 – Crain’s Cleveland Business highlights a significant grant from the Saint Luke’s Foundation to advance the Land Conservancy’s urban work. 1.10.2019 – The Beacon compliments our work to create Lucien M. Clemons Park as Marblehead was named the best small town in Ohio by INSIDER. 12.29.2018 – The Tribune Chronicle reports on the Land Conservancy’s partnership in expanding the Grand River Wildlife Area. 12.17.2018 – WFMJ reports on the signing ceremony designating Pymatuning Creek as a Wild and Scenic River. 11.29.2018 – Cleveland.com cites research from Western Reserve Land Conservancy’s housing trends research reports. 11.25.2018 – Crain’s Cleveland Business recognizes Land Conservancy President & CEO Rich Cochran as C-Suite Award Winner. 11.24.2018 – The Star Beacon reports on support for Red Brook Metropark. 11.20.2018 – Athens News reports on the Land Conservancy’s support of Athens County Land Bank efforts to remove blight. 11.16.2018 – Pacific Standard interviews the Land Conservancy’s Frank Ford on modern red lining practices defining Cleveland neighborhoods. 11.14.2018 – Detroit Metro Times shares insights from the Land Conservancy’s Frank Ford when analyzing demolition work in Detroit. 11.14.2018 – The Vindy reports on the Land Conservancy’s work to conserve 140 acres with Trumbull County MetroParks and HomeGoods. 11.12.2018 – Salem News reports on the Land Conservancy’s work to create Elk Run Preserve in Columbiana County. 11.7.2018 – News Channel 5 reports on the Land Conservancy’s work to remove blight in Cleveland’s Buckeye Neighborhood. 11.6.2018 – The Bay Village and Westlake Observer report on the Cleveland Tree Coalition’s efforts to reforest the Forest City. Western Reserve Land Conservancy is a proud member of the coalition. 11.5.2018 – Farm and Dairy reports on the Land Conservancy’s work to create Elk Run Preserve in Columbiana County. 11.2.2018 – The Chagrin Valley Times reports on an ODNR grant to build the Solon to Chagrin Falls Trail, a project the Land Conservancy support. 10.30.2018 – Cleveland.com shares more about Western Reserve Land Conservancy’s event taking place at Platform Beer Co.
10.24.2018 – News Channel 5 reports on Western Reserve Land Conservancy’s Cuyahoga County housing research. 10.22.2018 – The Advertiser-Tribune reports on our support of the Sandusky River Watershed Coalition. 10.4.2018 – News Channel 5 reports on Western Reserve Land Conservancy’s Cuyahoga County housing research. 10.4.2018 – The Morning Journal reports on a Watershed Mini Grant Award provided to Loco Yaks. 10.3.2018 – Cleveland.com reports on the 2018 Dominion Energy Watershed Mini Grant Awards distributed by Western Reserve Land Conservancy. 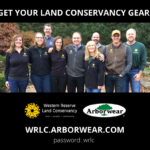 10.2.2018 – The Cleveland Cavaliers highlight Western Reserve Land Conservancy’s partnership on the Trees4Threes Planting. 9.27.2018 – WKYC Channel 3 talks to the Land Conservancy’s Frank Ford about the local housing market. 9.19.2018 – The Mansfield News Journal reports on a new trail created in partnership with the Land Conservancy’s Niss Waterfall conservation project. 9.19.2018 – News Channel 5 reports on our recent Cuyahoga County housing market trends study. 9.14.2018 – Kate Pilacky’s letter to the editor is published in the Oberlin Tribune. 9.7.2018 – The Tribune Chronicle highlights Manna Farms, a 200-acre permanently preserved property in Trumbull County. 9.6.2018 – The Star Beacon reports on land protection efforts along the Grand River in honor of the Ohio Scenic Rivers 50th Anniversary. 9.6.2018 – The Star Beacon reports on an upcoming meeting about the Red Brook Preserve in Ashtabula County. 9.5.2018 – The Port Clinton News Herald reports on the geologic history of the new Ed Curilla Preserve on Kelleys Island. 9.5.2018 – WKSU covers our recent Cuyahoga County housing market trends study. 9.4.2018 – The News Herald covers our recent Cuyahoga County housing market trends study. 9.4.2018 – U.S. News and World Report picked up our recent Cuyahoga County housing market trends study. 9.2.2018 – The Cleveland Plain Dealer reports on our recent Cuyahoga County housing market trends study. 8.31.2018 – The Warren Tribune highlights Western Reserve Land Conservancy’s efforts to conserve land in the greater Kinsman area of Trumbull County. 8.31.2018 – The Mansfield News Journal reports on work to acquire nearly 300 acres in Richland County. 8.29.2018 – WTAP reports on a successful Land Bank informational meeting in Washington County. 8.16.2018 – The Star Beacon reports on a recent tour Western Reserve Land Conservancy organized to highlight the positive impacts of the Great Lakes Restoration Initiative. 8.15.2018 – The Marietta Times reports on Western Reserve Land Conservancy’s efforts to support land banking efforts in Washington County. 8.6.2018 – The Sandusky Register reports on our Vermilion Beach Property work with Erie MetroParks. 8.9.2018 – The Ashtabula Gazette reports on our work to create Red Brook Preserve in Ashtabula. 8.7.2018 – In a letter to the Star Beacon, Western Reserve Land Conservancy’s work on the Pastured Beef and Conservation Easement Farm Tour is mentioned. 8.7.2018 – The Mansfield News Journal reports on our work to permanently conserve the Niss Waterfall property in Richland County. 8.3.2018 – The Star Beacon reports on our work to create Red Brook Preserve in Ashtabula. 7.21.2018 – Brett Rodstrom is quoted in The Vindicator about our work to preserve habitat for Eastern Massasauga Rattlesnakes. 6.28.2018 – Fresh Water Cleveland highlights our Director of Communications and Marketing, Emily Bacha, as an up-and-coming leader. 6.17.2018 – Crain’s Cleveland Business interviews Western Reserve Land Conservancy on our participation in Common Ground conversations. 6.9.2018 – The Cleveland.com reports on Western Reserve Land Conservancy’s work to plant trees in Brookpark. 5.25.2018 – The National Audubon Society reports on Black River Audubon Society and Western Reserve Land Conservancy’s work to plant trees during a community cleanup day. 5.20.2018 – The Chronicle-Telegram reports on Black River Audubon Society and Western Reserve Land Conservancy’s work to plant trees during a community cleanup day. 5.12.2018 – WKYC Channel 3 shares footage from the Voinovich Tree Planting project in Cleveland’s North Collinwood neighborhood. 5.11.2018 – The Akron Beacon Journal reports on the City of Akron’s efforts to remove blight ustilizing our property inventory information. 5.4.2018 – The Chillicothe Gazette reports on efforts of the Ross County Land Bank, which Western Reserve Land Conservancy helped establish. 5.2.2018 – Farm and Dairy reports on the Hiram Farm, a permanently preserved farm, that provides inspiration and meaningful work for the individual growth of people with Autism Spectrum Disorders. 4.27.2018 – Steve Litt of the Cleveland Plain Dealer reported on Arbor Day activities and efforts of the Cleveland Tree Coalition. 4.24.2018 – The Port Clinton News Herald reports on federal grant funding in support of Western Reserve Land Conservancy’s efforts to permanenty conserve the Bay Point Sandbar. 4.24.2018 – FreshWater Cleveland reports on the Land Conservancy’s Arbor Day celebrations. 4.7.2018 – The Salem News recognized the work of the Little Beaver Creek Wild & Scenic Advisory Council, as well as support from Western Reserve Land Conservancy. 4.1.2018 – Discover Norwalk Magazine featured two conservation landowners – the Kernell and Smith families – in their March/April issue. 3.21.2018 – CityLab reports showcases Western Reserve Land Conservancy as a traditional land trust that has turned its attention to urban areas in an effort to combat inequality and sprawl. 3.10.2018 – The Mount Vernon News reports on Western Reserve Land Conservancy’s help in establishing the Knox County Land Bank. 2.25.2018 – The Land Conservancy’s inner-ring suburban property inventory is cited in a Cleveland Plain Dealer report on the City of Euclid’s master plan. 2.16.2018 – The Sandusky Register editorial board praises the Land Conservancy’s work to permanently conserve the Bay Point Sandbar property in Ottawa County. 2.13.2018 – News 5 Cleveland covers a forum held by the Ohio Fair Lending Coalition at Cleveland State University on our recent work to study the impact of the foreclosure crisis on five of Cleveland’s inner-ring suburbs. 2.11.2018 – The Sandusky Register reports on the Land Conservancy’s work to acquire Bay Point Sandbar on the Marblehead peninsula. 2.7.2018 – The Suburbanite reports on the Land Conservancy’s work to create a new nature preserve in Coventry Township. 2.5.2018 – WVIZ Ideas spoke with the Land Conservancy’s Jim Rokakis and City of South Euclid Mayor Georgine Welo about the findings of our Communities at the Crossroads report. 2.3.2018 – The News Herald featured a story on the 103-year-old Haueter Farm in Huntsburg Township, Geauga County. The farm, permanently preserved with a conservation easement, was recently recognized as an Ohio Historic Family Farm. 2.1.2018 – The Port Clinton News Herald reports on plans for Lucien M. Clemons Park in Marblehead, a park created with the help of Western Reserve Land Conservancy. 1.30.2018 – The Mansfield News Journal reports on the Land Conservancy’s work with landowner Randall Derror to permanently conserve nearly 200 acres in Richland County. 1.30.2018 – The Land Conservancy’s Jim Rokakis appeared on WCPN ideastream’s Sound of Ideas to discuss findings from the Communities at the Crossroads report. 1.29.2018 – News 5 Cleveland interviews the Land Conservancy’s Jim Rokakis, as well as South Euclid’s Mayor Georgine Welo and Housing Director Sally Martin on the Communities at the Crossroads report findings. 1.28.2018 – The Plain Dealer reports on Communities at the Crossroads: A Survey of Five First-Ring Suburbs, a new collaborative report that examines the housing market challenges and opportunities facing Euclid, Garfield Heights, Maple Heights, South Euclid, and Warrensville Heights in the wake of the foreclosure crisis. 1.25.2018 – The Star Beacon reports on Western Reserve Land Conservancy’s work to create a new park on the site of the former Harbor Golf course. 1.20.2018 – The Chronicle Telegram reports on the Land Conservancy’s work with landowners Phyllis DeMark and Jean Hays to permanently conserve 25 acres in Lorain County. 1.19.2018 – The Richland Source reports on the Land Conservancy’s work with landowner Randall Derror to permanently conserve nearly 200 acres in Richland County. 1.18.2018 – The News Herald, Norwalk Reflector, and Port Clinton News Herald report on Western Reserve Land Conservancy’s work to acquire Bay Point Sandbar on the Marblehead peninsula. The organization is now working to permanently conserve the property, including rare and fragile habitat. 1.16.2018 – Rock the Lake reports on Western Reserve Land Conservancy’s work to acquire Bay Point Sandbar on the Marblehead peninsula. The organization is now working to permanently conserve the property, including rare and fragile habitat. 1.11.2018 – The Beacon reports on Western Reserve Land Conservancy’s work to acquire Bay Point Sandbar on the Marblehead peninsula. The organization is now working to permanently conserve the property, including rare and fragile habitat. 1.7.2018 – The Cleveland Plain Dealer reports on the revolutionary Tangent Watercycle piloted at the Land Conservancy’s Conservation Center in Moreland Hills. 1.3.2018 – The Record Courier reports on the Land Conservancy’s partnership with Portage Park District to acquire and permanently preserve nearly 200 acres in the City of Streetsboro. 12.28.2017 – The Richland Source reports on the success of the Richland County Land Bank which the Land Conservancy helped establish. 12.7.2017 – The Geauga Maple Leaf reports on the Land Conservancy’s support Geauga County Soil and Water Conservation District’s annual meeting. 11.30.2017 – The Cleveland Plain Dealer reports on the Land Conservancy’s work with Cleveland Metroparks to acquire 102 acres and expand Brecksville Reservation. 11.11.2017 – The Columbus Dispatch reports on the progress of the Ohio county land bank movement. 11.10.2017 – The Beacon provided an update on plans for Lucien M. Clemons Park. The Land Conservancy helped create this new park for the Village of Marblehead. 11.07.2017 – The Portsmouth Daily Times reports on the Dominion Energy and Western Reserve Land Conservancy Watershed Mini Grant awarded to the Friends of Scioto Brush Creek. 11.04.2017 – The Vindicator reports on the Dominion Energy and Western Reserve Land Conservancy Watershed Mini Grant awarded to the Little Beaver Creek Wild and Scenic River Advisory Council. 10.31.2017 – The Springfield News-Sun reports on the work completed by the Clark County Land Bank and the work of our county land bank program. 10.30.2017 – WDTN Dayton reported on blight in Dayton, citing our 2015 property inventory of the city. 10.30.2017 – Frank Ford shares his research on forfeiture sales with WCPN ideastream. 10.22.2017 – The Chronicle Telegram reported on a tree planting conducted by the Land Conservancy and the Rotary Club of Oberlin. 10.16.2017 – The Cleveland Plain Dealer reported on the Land Conservancy’s tree planting in Cleveland’s Buckeye neighborhood thanks to an American Forests’ Community ReLeaf grant. 10.15.2017 – The Cleveland Plain Dealer ran an editorial on SEED Ohio and how it benefits Western Reserve Land Conservancy. 10.05.2017 – WVIZ ideastream reported on the Trees for Threes initiative in which Western Reserve Land Conservancy has partnered for the past three years. 10.04.2017 – The Star Beacon reported on the opening of Eyring Wetlands Metropark, a new park the Land Conservancy helped conserve. 09.07.2017 – News 5 Cleveland reported on the Land Conservancy’s efforts to address blighted homes in Cleveland. 07.20.2017 – Fresh Water Cleveland published an update on the Land Conservancy’s Reforest Our City efforts. 07.18.2017 – Julie Cook’s art show at the Land Conservancy’s Conservation Center was highlighted in the News Herald. Her show is on display at the Conservation Center through September 20, 2017. 07.18.2017 – A boat tour of the revitalized Black River in Lorain County was the focus of articles in The Chronicle and The Morning Journal. 06.30.2017 – The Land Conservancy’s Young Professional Group was highlighted in the Summer 2017 Saving Land magazine published by the Land Trust Alliance. 06.28.2017 – The Ashtabula Star Beacon published a preview piece on our work to transform the Harbor Golf Club into Red Brook Metropark. 06.07.2017 – A national article on NextCity.com highlighted the Land Conservancy’s work with Case Western Reserve University exploring the relationship between vacant and distressed properties and community health and safety. 06.04.2017 – The Land Conservancy’s work with the Audubon Society of Greater Cleveland to expand the Hach-Otis Sanctuary was featured in the News Herald. 05.14.2017 – The Medina Gazette covered our Mother’s Day at Medina Marsh event which took place on Saturday, May 13. 05.14.2017 – The Land Conservancy’s work with the Audubon Society of Greater Cleveland to expand the Hach-Otis Sanctuary was featured in the Cleveland Plain Dealer. 04.28.2017 – WEWS Channel 5 ran segments on the Cleveland Tree Coalition’s tree canopy announcement, featuring the Land Conservancy. 04.28.2017 – The Land Conservancy worked with members of the Cleveland Tree Coalition to publish an op-ed in the Cleveland Plain Dealer on the city’s new tree canopy goal. 04.27.2017 – The Oberlin OnCampus Newspaper wrote a piece on the prairie restoration planting organized by Western Reserve Land Conservancy and students at Oberlin College on Earth Day weekend. A feature will also run in the Oberlin Alumni magazine. 04.27.2017 – Our work to create the Upper Grand Metropark with Ashtabula County Metroparks was featured by the Ashtabula Gazette. 04.20.2017 – A large feature on the Land Conservancy’s many Arbor Day events was published by Fresh Water Cleveland. 04.19.2017 – The Ashtabula Star Beacon featured an article on our work to create the Upper Grand Metropark with Ashtabula County Metroparks. 04.14.2017 – WKYC Channel 3 dedicated a segment of their new community-focused show We the People on proper tree planting and the Land Conservancy’s work with the Cleveland Tree Coalition. 02.12.2017 – The Cleveland Plain Dealer reported on the disparity between the home sale price recovery on the city’s west side compared to the east side, a study authored by the Land Conservancy’s Frank Ford. 02.07.2017 – WCPN featured a story, Gap In Housing Recovery Goes Along With Blight Levels, which highlighted findings from a study authored by the Land Conservancy’s Frank Ford. 02.06.2017 – The Chronicle Telegram issued an extensive look at the results of the Elyria Property Inventory. 01.29.2017 – The Review published an article on the Land Conservancy’s work with the Columbiana County Park District to create new parkland near the Little Beaver Creek Greenway Trail. 01.02.2017 – Frank Ford shared his insights on expedited foreclosures with the Akron Beacon Journal.